In Samuel Eliot Morison's "The Oxford History of the American People," there is a single sentence about Harriet Tubman. "An illiterate field hand, (Tubman) not only escaped herself but returned repeatedly and guided more than 300 slaves to freedom." Morison, however, devotes most of five chapters to the greatest soldier-statesman in American history, save Washington, that pivotal figure between the Founding Fathers and the Civil War -- Andrew Jackson. In one of the greatest victories in American history, memorialized in song, Jackson routed a British army and aborted a British scheme to seize New Orleans, close the Mississippi, and split the Union. In 1818, ordered to clean out renegade Indians rampaging in Georgia, Jackson stormed into Florida, seized and hanged two British agitators, put the Spanish governor on a boat to Cuba, and claimed Florida for the USA. Though he ran first in popular and electoral votes in 1824, Jackson was denied the presidency by the "corrupt bargain" of Adams and Henry Clay, who got secretary of state. He ended his life at his beloved Hermitage, pushing for the annexation of Texas and nomination of "dark horse" James K. Polk, who would seize the Southwest and California from Mexico and almost double the size of the Union. Was Jackson responsible for the Cherokees' "Trail of Tears"? Yes. And Harry Truman did Hiroshima, and Winston Churchill did Dresden. Great men are rarely good men, and Jackson was a Scots-Irish duelist, Indian fighter and slave owner. But then, Presidents Washington, Jefferson, Madison and Monroe were slave owners before him. To remove his portrait from the front of the $20 bill, and replace it with Tubman's, is affirmative action that approaches the absurd. Whatever one's admiration for Tubman and her cause, she is not the figure in history Jackson was. Indeed, if the fight against slavery is the greatest cause in our history, why not honor John Brown, hanged for his raid on Harper's Ferry to start a revolution to free the slaves, after he butchered slave owners in "Bleeding Kansas"? John Brown was the real deal. 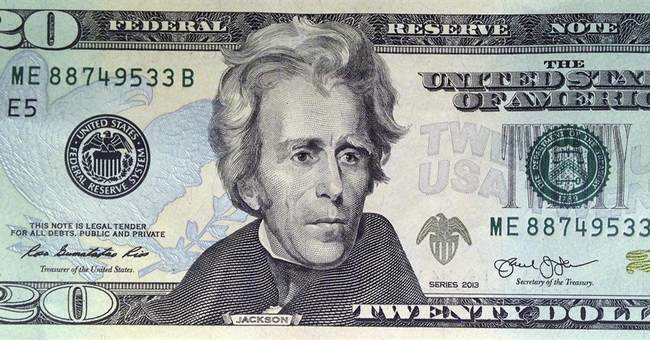 But replacing Jackson with Tubman is not the only change coming. That act of race discrimination came during the second term of FDR, Eleanor's husband and the liberal icon who named Klansman Hugo Black to the Supreme Court and put 110,000 Japanese into concentration camps. And, lest we forget, while Abraham Lincoln remains on the front of the $5 bill, the war he launched cost 620,000 dead, and his beliefs in white supremacy and racial separatism were closer to those of David Duke than Dr. King. Alexander Hamilton, the architect of the American economy, will stay on the $10 bill, due in part to the intervention of hip-hop artists from the popular musical, "Hamilton," in New York. But Susan B. Anthony, Elizabeth Cady Stanton and Sojourner Truth, who fought for women's suffrage, will be put on the back of the $10. While Anthony and Stanton appear in Morison's history, Sojourner Truth does not. Added up, while dishonoring Andrew Jackson, Treasury Secretary Jack Lew is putting on the U.S. currency six women -- three white, three African-American -- and King. No Catholics, no conservatives, no Hispanics, no white males were apparently even considered. This is affirmative action raised to fanaticism, a celebration of President Obama's views and values, and a recasting of our currency to make Obama's constituents happy at the expense of America's greatest heroes and historic truth. Leftist role models for American kids now take precedence over the history of our Republic in those we honor. While King already has a holiday and monument in D.C., were the achievements of any of these six women remotely comparable to what the six men honored on our currency -- Washington, Jefferson, Hamilton, Jackson, President Grant and Ben Franklin -- achieved? Whatever may be said for Eleanor Roosevelt, compared to her husband, she is an inconsequential figure in American history. In the dystopian novel, "1984," Winston Smith labors in the Ministry of Truth, dropping down the "memory hole" stories that must be rewritten to re-indoctrinate the party and proles in the new history, as determined by Big Brother. Jack Lew would have fit right in there.